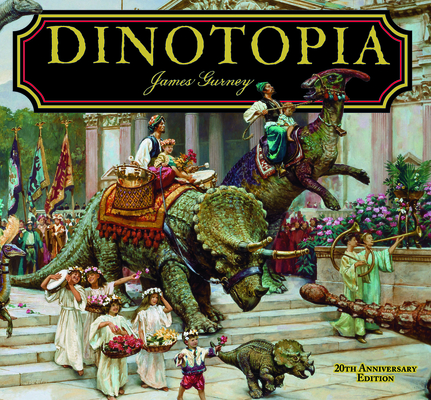 When James Gurney's Dinotopia: A Land Apart from Time first appeared in 1992, it was immediately hailed as a fully imagined world of the caliber of J. R. R. Tolkien's. Gurney's premise -- of an undiscovered island where a race of mystical humans co-exists in harmony with intelligent dinosaurs -- has been since reiterated over and over in numerous films and by scores of other writers. Now, Calla Editions brings Gurney's spectacular artistry to a new generation in this 20th anniversary edition. Digitally re-rendered from the original transparencies, Gurney's dramatic panoramas of Dinotopia and close-up character studies of its inhabitants -- both human and saurian -- take on new vitality. And as a tale of high adventure and discovery told as entries and sketches in journal form, Dinotopia presents a shipwrecked visitor's glimpse into an imagined social order, a culture, and even a cooperative interspecies technology that will satisfy lovers of fantasy and science fiction of all persuasions. This edition includes a new Afterword written by author James Gurney as well as a special section of behind-the-scenes studies and maquettes he used in developing his paintings. Before writing and illustrating Dinotopia, James Gurney painted reconstructions of ancient civilizations for National Geographic magazine. He has illustrated seventeen stamps for the U.S. Postal Service, including The World of Dinosaurs. His Dinotopia artwork has won the Hugo, Chesley, Spectrum, and World Fantasy Awards and has been exhibited at the Smithsonian Institution, the Norman Rockwell Museum, and the Delaware Art Museum. His most recent books, Imaginative Realism: How to Paint What Doesn't Exist (2009) and Color and Light: A Guide for the Realist Painter (2010), are based on his daily blog gurneyjourney.blogspot.com.